Posted by Steve on April 18, 2012 . 6 comments. Leclerc De Buffon was a French naturalist known for his comprehensive writings on natural history. He ended his zoological description of the horse with the preceding quotation, which, sadly, is still very much the case. For example, I attended a presentation at the Equine Affaire last weekend that was a mixture of good anatomy and bad advice concerning what a horseshoe can and cannot do for the horse. And a number of the presenter’s comments were directly relevant to the subject of this post: the relationship between the internal structures of the hoof and the external hoof wall. Let’s start by talking about what matters to the horse. After all, he’s the real beneficiary (or victim) of hoof care. First and foremost, he doesn’t care about what his foot looks like; he cares only about how it functions. And the point of departure for proper function is correct alignment of the bones of the lower limb, as shown in the accompanying illustration. However, I want to point out three things about this image before I continue. First, it’s not quite correct; the bottom rim of the coffin bone isn’t really parallel to the ground. Rather, it forms about a 3° angle with respect to the bearing surface. 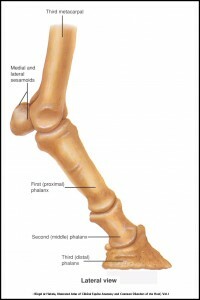 Second, they haven’t labeled the navicular bone – that tiny bone directly behind the short pastern/coffin joint. And third, note that in this lateral (side) view, the “front” of the bones (not counting the navicular bone, of course) are roughly in line with each other. If the angle of the “front” of the hoof wall matches the angle of the “front” of the pastern bones, the hoof must be properly trimmed. Which one would you want your farrier to use? If you’re 100% certain your horse’s hoof is like the one on the upper left, things would probably be fine. But the upper-right hoof is pretty typical-looking in appearance, yet the radiograph reveals a 5° discrepancy between the hoof wall and coffin bone. That means if your farrier uses this horse’s wall as a reference, he/she is going to “rotate” the coffin bone 5° out of alignment, causing an imbalance in the tendon and ligament tensions. From here, it only gets worse. 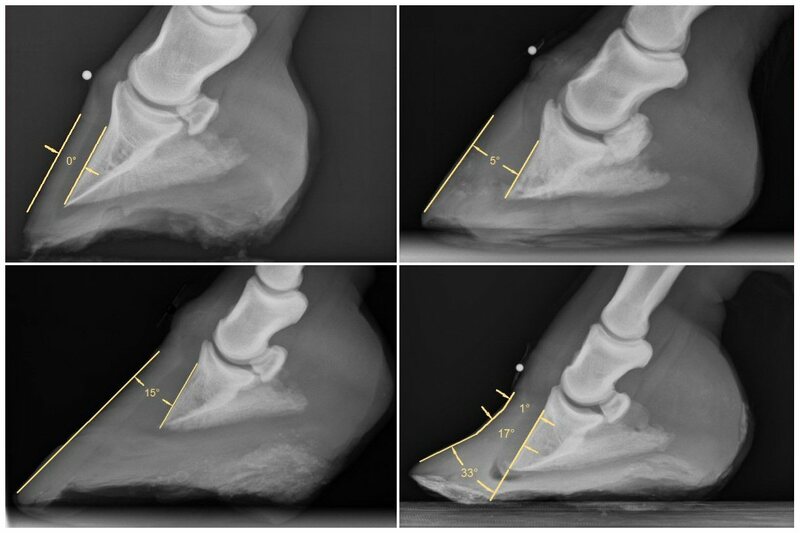 While fairly long, the hoof in the lower-left radiograph has a smooth-looking hoof, which means many farriers and vets would attempt to match the hoof-pastern angle, leaving the heels too long with respect to the toe and/or wedging up the heels with a shoe/wedge pad. The result? A horse with a misalignment of 15°! Then, when the horse starts having heel pain (because he’s pounding down on his heels), someone will eventually x-ray the horse and declare the coffin bone is “rotated” 15°. The horse can’t win! Remember – the horse doesn’t care what his foot looks like. He cares only about how it functions. And bone/joint misalignment means he’s not going to function as well as he could. The lower-right image shows a laminitic horse with at least three distinct hoof angles. Which should your farrier follow? This is why trimming methods based on lengths and angles and numbers of any sort can’t possibly work. The only way to ensure the foot will be properly balanced is to use the bottom of the foot – with an accompanying comprehensive understanding of the characteristics of the various tissues present – as the singular guide for trimming. Armed with that knowledge, every foot you trim will always be correct! 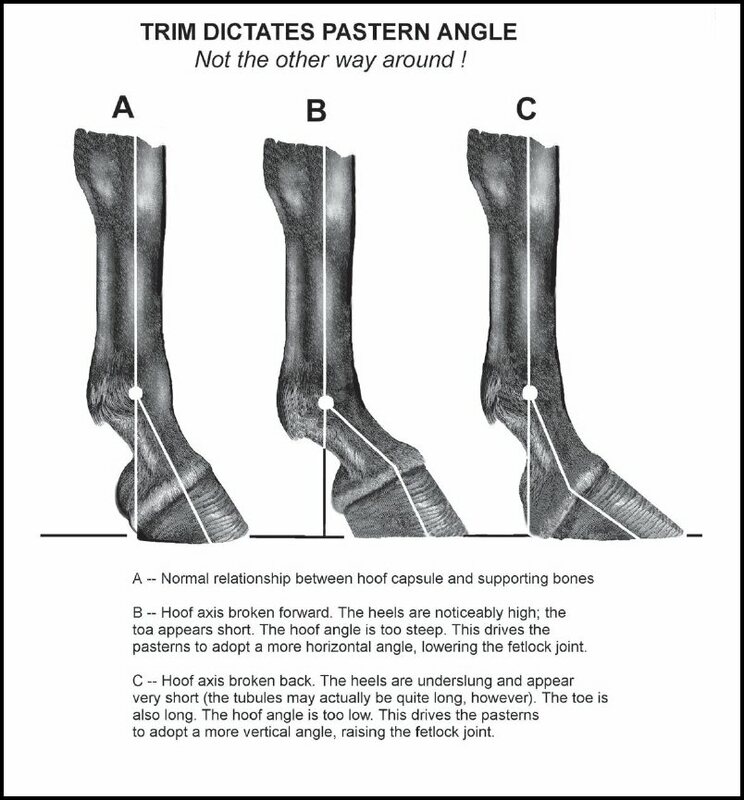 Share the post "Hoof Angles – Part 3"
The quick answer is that both laminitis and thrush can not be caused by a trimmer, regardless of whom the trimmer is or where he/she studied. Both conditions, however, can be exacerbated by the trimmer through either poor trimming, which may impede the healing process, or by poor owner education, which may prevent the owner from making the necessary changes in the horse’s life style to address the underlying causes and facilitate healing. You can help get a better handle on whether or not your trimmer has been properly trained, particularly with respect to trimming a laminitic horse, by asking specific questions about his/her training, and by talking to other of his/her clients. Ask about the causes and treatments of the conditions you mentioned, and compare those answers with some of what I’ve provided throughout this blog. The AANHCP (Jaime Jackson’s organization) has undergone a number of fairly radical changes in its training process over its life, and, unfortunately, not everyone in the organization was necessarily properly trained to trim the laminitic horse. In fact, that deficiency is what led me to create the laminitic trimming workshop I now teach through Liberated Horsemanship. Jaime’s method for trimming laminitic horses is very specific and very effective, but, in my experience, many of the certified practitioners, at least at one point in time, lacked that training. So find out how many laminitic horses the practitioner has personally cared for, and talk to the owners of those horses. In every case I’ve dealt with, there has been an immediate and profound change in the horse’s comfort level following the first trim. And unless the horse is some sort of odd exception (which a 9-degree coffin bone-hoof wall divergence is not), there should be no “rotation” on a radiograph taken immediately after a trim. If there is, your trimmer is not trimming properly. We generally don’t even use the term “rotation,” because it implies that the veterinarian or farrier doesn’t truly understand what happens in the laminitic foot. Finally, ask to see your trimmer’s certification. I’ve heard of a number of people claiming to be certified and claiming to have studied with Jaime that he has no knowledge of! Good luck with your pony. I’m sorry this answer couldn’t be more extensive, but it would really take an entire blog post (or two) to give a more complete response. With proper trimming and care, can a horse with hooves similar to illustration C, be brought back to illustration A? Hi Rebecca. Yes, in most cases, it’s simply a matter of proper trimming. Often, hooves look like “C” because the heels have been left too long and are crushed forward (“underrun” or “run-under” heels). However, I must caution you that properly-trimmed hooves can more often resemble “C” than people might think they should, because they’ve gotten used to this false notion that heels are “supposed” to be long. Nevertheless, a proper trim will have the entire foot as short as the tissue allows it to be. Yes, I’d be willing to bet that her heels are already too long, and the wedges are making the problem worse. Radiographs would definitely confirm that IF the person looking at them understands what joint alignment and the relationship of the coffin bone to the ground are supposed to look like. But someone with proper training can tell that without the radiograph as well. 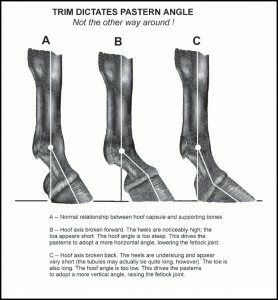 If the trimmer has to take off a large amount of heel when trimming a horse’s heels to the correct height for the first time, there’s a good chance that horse will be sore for several days – or possibly even weeks – because of the soft-tissue changes resulting from the new foot angle. This usually manifests itself as swelling along the deep-flexor tendon down the back of the cannon bone and/or just above the fetlock. If this is the case with your horse, cold-hosing and massaging something like Aspircreme along the tendon once or twice a day will help get him/her through that period of discomfort.